The Red Sox made a flurry of moves on Wednesday as fallout from last week's 40-man roster transactions continued. The club traded pitcher Zach Stewart (pictured) to the Pittsburgh Pirates, pitcher Sandy Rosario to the Oakland A's, and infielder Danny Valencia to the Baltimore Orioles. Boston will receive players to be named later for the first two, and will receive either a PTBNL or cash for Valencia. 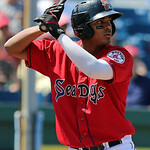 Earlier this week, infielder Ivan De Jesus, Jr. was outrighted to Pawtucket after clearing waivers. The only player designated for assignment last week whose future is still uncertain is reliever David Carpenter. With the Arizona Fall League and World Baseball Classic qualifier over, the remaining winter leagues around the world grabbed the spotlight as many prospects continued to get in off season work. Yeiper Castillo continued to be solid in relief as he allowed five hits without allowing a run in 2 2/3 innings pitched over two outings this week. Marco Duarte had his second rough start in a row as he was shelled for six runs on ten hits in just 3 2/3 innings as he suffered the loss on Wednesday against Guasave. Tuesday marked one of the more hectic roster management days in recent memory for the Red Sox, at least of the non-trade variety. Overall, the club designated five players for assignment and added six minor leaguers to the 40-man roster, protecting them from selection in next month’s Rule 5 draft. A typical 40-man deadline day for Boston involves maybe two or three minor leaguers being added, so the relative chaotic transactions this year are worth analyzing. I’ll start by looking at each player involved (or, where relevant, not involved) in yesterday’s transactions. To close, I’ll see if we can make any general observations. With the deadline at 11:59 tonight to add players to the 40-man roster in order to protect them from selection in December's Rule 5 draft, the Red Sox announced a series of roster moves. 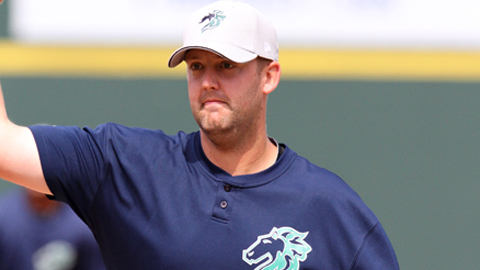 They added six players to the roster: pitchers Allen Webster, Alex Wilson, and Steven Wright, catchers Christian Vazquez and Dan Butler, and outfielder Alex Hassan. In corresponding moves, the Red Sox designated for assignment pitchers Zach Stewart, Sandy Rosario, David Carpenter, third baseman Danny Valencia and infielder Ivan De Jesus. Following the flurry of moves, the Red Sox have all 40 roster slots filled. 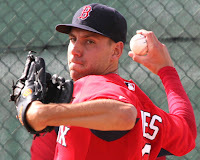 Look for Boston to make three to five roster moves on Tuesday to protect some minor leaguers from selection by other teams in the 2012 Rule 5 Draft. Check out our projections on ESPN Boston. The Surprise Saguaros finished third in the Arizona Fall League with a 17-14-1 record as the Red Sox contingent appeared in their final games this week. Other winter leagues continued to ramp up, while two Red Sox players participated in the World Baseball Classic Qualifier. Michael Almanzar appeared in three games this week, going 2 for 11 with two doubles. Almanzar struggled mightily this fall, posting a .185/.272/.235 line in 81 at-bats. Each team is only allowed to enter one position player in the AFL who played below the Double-A level in the previous season, and since Almanzar was that player this year, his struggles are not surprising. With more offseason leagues beginning this week, many of the Red Sox top prospects are currently seeing action in various leagues around the world. For full statistics, make sure to follow our Fall/Winter League page, which is updated daily. Christian Vazquez appeared in his last game for Surprise on Monday as he left the team to join Atenienses de Manati of the Puerto Rican Baseball League. Vazquez played in 10 games for the Saguaros, hitting .257/.395/.429 with a home run and three RBI. 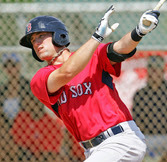 SoxProspects.com has learned that the Red Sox have agreed to terms with New England native Terry Doyle on a minor league contract with an invitation to spring training. Doyle, a right-handed pitcher, last pitched for the Fukuoka Softbank Hawks of the Japanese Pacific League after four and a half seasons in the Chicago White Sox system. 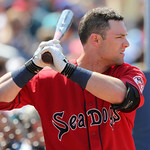 Doyle, who will be 27 this season, was selected by the White Sox in the 37th round of the 2008 draft out of Boston College. Having advanced as high as Triple-A Charlotte, with whom he spent the first half of 2012, going 6-3 with a 2.83 ERA in 12 appearances, 11 starts. He allowed 53 hits and 18 walks in 76 1/3 innings while striking out 71 before asking for his release to sign with Fukuoka. Veteran outfielder Mitch Maier has signed a minor league contract with the Red Sox, according to Matt Eddy of Baseball America. Per Alex Speier of WEEI.com, the deal includes an invitation to spring training. A number of prospects saw limited action this week with some faring quite well. In one of the most anticipated events of the Arizona Fall League, the annual Rising Stars game took place on Sunday. For full statistics, make sure to follow our Fall/Winter League page, which is updated daily. Christian Vazquez appeared in only two games this week, going 2 for 7 with an RBI and two walks. Vazquez has had a very good fall thus far, hitting .290/.436/.484 with a home run, three doubles and three RBI in nine games, although his nine hits have come in three of those games. Pre-2012: Cecchini was high on many draft radars in 2010. The shortstop from Barbe High School in Louisiana showed polish on both sides of the ball at an early age in his junior season, but an ACL injury cost Cechini the majority of his senior year. 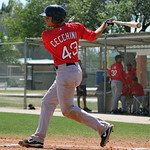 He was selected by the Red Sox in the fourth round of the 2010 draft, and Boston was able to sign Cecchini away from a strong commitment to LSU with a $1.31 million bonus. Red Sox right fielder Bryce Brentz (pictured) and infielder Michael Almanzar have been selected to play in the Arizona Fall League's Rising Stars Game on Saturday. The game will air live on the MLB Network and MLB.com at 8 p.m. ET. The game is less an all-star game than it is a showcase of the top talents playing in the circuit, so Brentz and Almanzar's selections say more about their prospect status relative to others playing in Arizona than it does about their performance thus far. The pair has been part of a seven-player Sox contingent playing for the Surprise Saguaros in the annual fall league. Pre-2012: Swihart was taken with the 26th overall pick by the Red Sox in the 2011 draft and signed on August 15 for an over-slot bonus of $2.5 million. The high school catcher out of New Mexico was widely regarded as a top-15 talent, but a strong commitment to the University of Texas and high bonus demands allowed him to fall to the Red Sox. 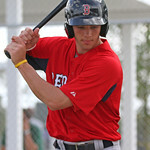 Because he signed on the last possible day, Swihart only played two games in 2011 for the Golf Coast League Red Sox.